Why not Canvas for this course? 1.1 What is Social Network Analysis? 1.1.1 A light intro video made by colleagues from Duke. 1.2 Why Social Network Analysis? 1.2.2 Networks are everywhere! Getting inspired? 11.1.1 Why temporality in networks matters? 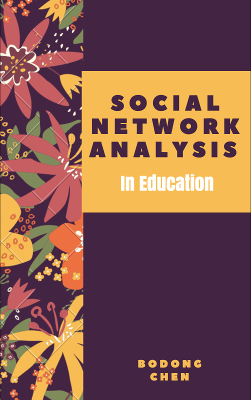 This site is the course portal of CI 8371 - Applied Social Network Analysis in Education, taught by Prof. Bodong Chen at the University of Minnesota in Spring ’19. Content on this site is actively built and refined throughout the semester. Textbook Carolan (2014). Note: UMN library access required. Slack team: We use Slack for course “management”, aka. announcements, commucations, chats, small group work, etc. You can also get connected with course alumli via public Slack channels. Hypothes.is: We interact on top of web materials (including the textbook) during this course. Hypothesis is a cutting-edge, open-source web annotation tool, which is used more and more broadly by educators in the past two years. Optional – Twitter hashtag #SNAEd: You can tweet about this course using #SNAEd. This site or book is licensed under the Creative Commons Attribution-NonCommercial-ShareAlike 4.0 International License.